The first time I went horse riding, my horse immediately tried to kill me (by running under a roof that was too short for me). Maybe they have a wind trap to collect water on the hill. Mighty Jalapeno wrote: People still use Fahrenheit? Is this like when I go to the States and suddenly I have to drive half as fast? As illustrated in the comic, Fahrenheit is a lot more useful for describing everyday weather. I'm surprised noone has suggested Kelvin yet. As long as you care about SI standards over useability, you might as well use the actual standard. Re: The REAL "Trouble for Science"
Neil_Boekend wrote: Environmentally it's not as wise. I've actually wondered about that. Given that I live in an area with a severe water shortage, it seems like all the water saved from not washing dishes would more than make up for that. But I have no idea what the actual numbers are. The second panel actually does apply to me. But that's because I decided that paper plates and plastic cups are so cheap that it's not worth getting permanent dishes and washing them all the time. troyp wrote: I'm sorry, I have to ask: can you think of a *more* obvious and straightforward way to count the number of bits in a int than the one you quoted? Because personally, I would find *that* amazing. CodeMirror also allows custom syntax highlighting if you need something web based. I haven't tried to define custom autocomplete though so I don't know how well that works. Has anyone seen the Koala yet, or did it get filtered out? So that's where that came from. I only know about it due to Cards Against Humanity, where "Kid tested, mother approved" ended up paired with "a coathanger". What I'm wondering is how he managed to get past security in the first place. It's far less physically plausible, but the timeline system in Achron is logically consistent and still allows messing with the past. It's more suited for a videogame than a narrative though. I've read that the problem with the ramjet is that the process of confining the gas for fusion causes it lose energy via synchotron radiation. If you already had an energy source on the ship, could you save reaction mass by accelerating the gas without confining it? The Thirty Meter Telescope will be renamed The Flesh-Searing Eye on the Volcano. 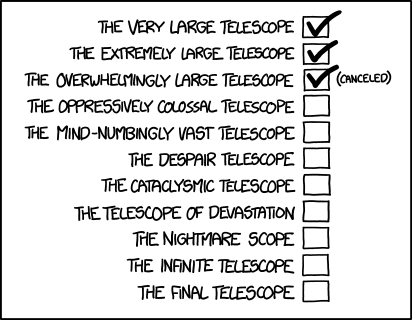 Replace telescope with cookie, and this is pretty much how Cookie Clicker goes. I once got an email intended for someone with the same last name as me. My email address was just [lastname] while theirs was completely different, so presumably the sender had just guessed the email address.